Our main offices are located in historical Guggenheim Hall, in central campus, just east of Drumheller Fountain and south of the HUB. Other UW campus buildings that house A&A programs and labs are the Aerospace Engineering Research Building, Kirsten Wind Tunnel and the Aerodynamics Laboratory. UW Commuter Services provides the following directions to the University of Washington. Commuting Options: UW Transportation Services provides an overview of Commute Options to help you find the transportation option that best fits your needs. 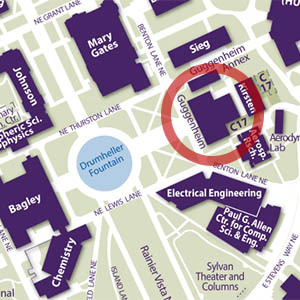 Bus and Light Rail: Visit Metro's trip planner and use HUB as your destination (the Husky Union Building is behind Guggenheim Hall). Bicycle: The Burke-Gilman Trail runs right through UW on the east and south sides of campus, providing several access points to the campus.